Advocates for Urban Agriculture – $5,000 – The support from CHIditarod will go directly to growing AUA’s impact on populations that struggle with healthy food access. The impact is two-fold: a larger production of healthy food for the community and economic development of programs that get that food into the hands of Chicagoans. AUA’s training initiative will ultimately help farmers access the tools they need to more successfully do what they do best – grow food that will increase their prosperity and that of their communities. Bronzeville Neighborhood Farm – $1,000 – Bronzeville Neighborhood Farm is a community urban agriculture site managed by the Bronzeville Alliance and sponsored by NeighborSpace. One year ago, the Bronzeville Urban Site was an empty lot. Today, Bronzeville Alliance has facilitated community construction of garden beds and a hoop house, paving the way for successful crop production in 2018. This farm is a community anchor, securing long-term residents in the neighborhood through home-grown social connection. This community farm’s mission is to bring people from different income levels and backgrounds together through shared neighborhood effort. Dignity Diner – $5,000 – Dignity Diner is a local ministry that offers a free three course meal to community members every Tuesday evening. 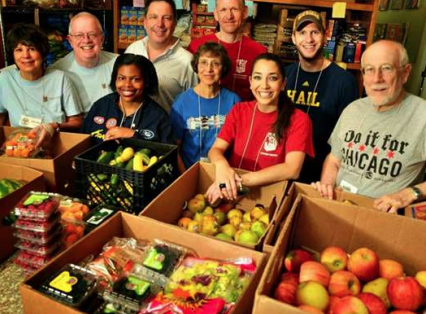 Holy Covenant United Methodist Church—alongside volunteers from the community—have been serving the hungry and the homeless in the Lincoln Park/Lakeview neighborhood since 1992. Over the last 27 years, more than 60,000 meals have been served at Dignity Diner. The cost of food service at Dignity Diner averages $300 a week, including food, supplies, and staff— the grant from CHIditarod would provide more than 16 weeks of high quality meals to local guests. Figeroa Wu Foundation – $5,000 – The Figueroa Wu Foundation supports groups like the UI Health Pilsen Food Pantry, which opened in January 2008 and serves vulnerable Chicagoans by reducing immediate food insecurity. In as few as nine months, Figueroa Wu has served thousands of people. 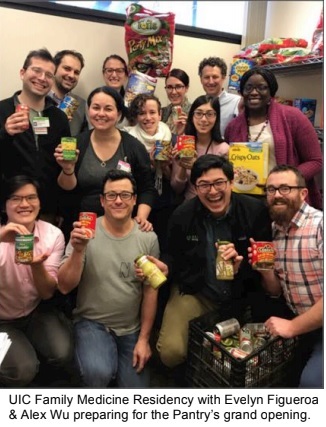 UI Health Pilsen Food Pantry will use their grant to train more volunteers, increase their food storage capacity, and increase the number of people served. Gardeneers – $4,000 – Gardeneers is making an impact across Chicago Public Schools. This grant will increase the amount of produce grown for farm stands by expanding the production area of 25 school gardens. Half of the money will be used to physically expand these gardens, covering lumber, soil, mulch, seeds and seedlings. The other part will be used to purchase materials needed for farm stands, such as tables, chairs, shade tents, display baskets, informational signage, recipe cards, and flyers for community recruitment. Holsten Human Capital Development – $5,000 – Holsten Human Capital Development currently serves 3,500 households in 15 Chicagoland communities in addition to Riverdale and Joliet. This grant is supporting their Riverwalk Heal food pantry, housed in a space recently vacated by the Loving Word Ministries Food Bank in the Riverwalk Homes public housing complex in Joliet. Holsten Human Capital Development stocks the shelves for distribution for the pantry’s Thursday food distribution and emergency food requests. New Eclipse Community Alliance – $3,000 – New Eclipse Community Alliance offers food assistance through a client model, allowing people seeking services to choose for themselves what products they receive. This makes stocking easier for the pantry, affords the people served dignity and control, limits food waste, and allows the program to tailor the help received to fit each unique situation. This funding opportunity will help sustain the food pantry, which serves 54 households and 174 individual clients monthly. Peterson Garden Project – $2,000 – Since Peterson Garden Project began with a single Pop-Up Victory Garden in 2010, growing food specifically for neighbors in need has been a priority of their Grow2Give program. Over the past nine years, they have trained volunteer gardeners and worked closely with local nutrition partners to grow fresh food just for their clients – our neighbors. Each year, our Grow2Give volunteer gardeners grow, harvest, wash, package, and deliver an average of 2,500 pounds of fruits, vegetables, and herbs for our neighborhood partners: Howard Area Community Center in Rogers Park, Inspiration Café in Uptown, Lincoln Square Friendship Center and First Slice Pie Café in Albany Park, North Part Friendship Center in North Park, and Care for Real in Edgewater. That’s 10,000 servings of fresh food for people in our communities.